This is a paper pieced border. Tip 1: If you are truly a beginning paper piecer, I would recommend adding ¼” or more to all measurements. This will give you a little extra wiggle room as you learn the process. Tip 2: It is a good idea to use a pressing cloth or other protective sheet when you iron. The ink may come off of your marked areas and can leave a mess on the ironing board. 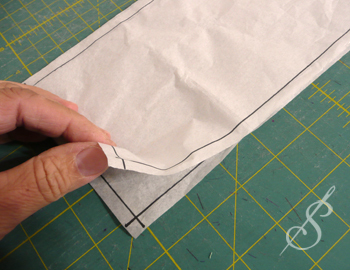 Determine the length and width you want your borders to be (make sure you include all necessary seam allowances). Cut (4) paper templates to the desired size. I like to use tissue paper, but any light weight paper works well. In most cases, you will need to tape several cuts together to get the length you need. Using a ruler and a pencil, mark a 1/4" line around the perimeter of all of the paper templates. This will be the seam line. Set 3 of the templates aside for now. Fold the template in half, widthwise. Fold it in half widththwise) again, bringing the FOLD to the SEAM LINE. Continue to fold the template in half, always bringing the fold to the seam line, until you have folded it as many times as you want (or can). Finger press both ends to make heavy creases. Unfold the template. It should now have evenly spaced crease marks across the entire length. These marks will serve as guides for making the points. The second line will come in from the opposite direction, and will form a triangle. The third line will divide the triangle in half. All 3 lines will converge at the same point. Continue to add this group of 3 lines all the way across the paper template. Paper piece this template. If you need help with paper piecing, check out this tutorial. It is specific to a New York Beauty Block, but the process is the same. To trim the border, place it paper side up on a cutting mat and trim it even with the edge of the paper. This can be done with a rotary cutter and ruler, or with scissors. Repeat to make the other 3 borders.